It’s not easy to come up with creative group projects that satisfy Common Core standards—or is it? Here are four projects that integrate CCCS standards—as well as collaboration and creativity. Whether you’re new to Twitter or have 5,000 LinkedIn connections, one thing’s for sure: social media keeps getting more popular and more powerful. If you haven’t used it for your own professional development, what are you waiting for? 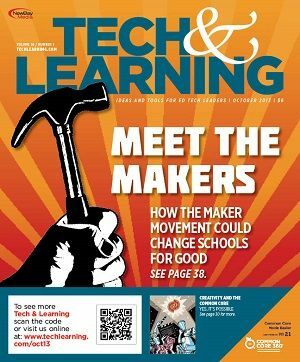 Sylvia Martinez and Dr. Gary A. Carnow discuss why they are excited about the Maker Movement—and why you should be, too. • Do you think the revised e-rate program will be enough to fund all of the connectivity needs of schools and districts? Steven Baule makes the case for saving librarians.